Deborah LeBlanc, MMS PA-C, is a nationally certified physician assistant, specializing in medical dermatology and skin care. She has been in healthcare since 1996, including work in cardiology at Orlando Regional Medical Center. Debbie earned her Associates in health science from William Rainey Harper College, and her BS in exercise and sport science from the University of Florida. She also has a BS in physician assistant studies and a MS in Medical Science from Nova Southeastern University in Ft. Lauderdale. She has extensive experience in the field of dermatology and has trained with Dr. Michael Gutierrez and other board certified physicians in the dermatology specialty. 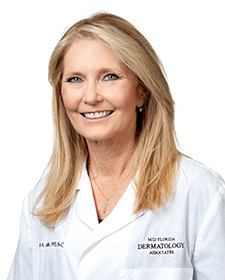 Debbie is a member of the American Academy of Physician Assistants, the Society of Dermatology Physician Assistants, Florida Society of Dermatology Physician Assistants, and the Aerobics and Fitness Association of America. She is active in fundraising for the Greater Clermont Cancer Foundation, Houndhaven, and South Lake Animal League.